Lately I have been making this chutney that was originally meant to be made with just Plums and adding peaches and apricots. It’s great for this time of year when you may a few less than perfect pieces of fruit in the fridge. My favorite thing about this chutney other than being able to use local fruit in season is the crystallized ginger and if you are anything like me you will make it a very generous 2 tablespoons! In a medium saucepan over medium heat add: 3 Tablespoons of unflavored Oil like Sunflower or organic canola. When it is hot, but not smoking, add 1/2 Teaspoons Fennel Seeds, 1/2 Teaspoon Kalonji, 1/2 Teaspoon Black Mustard seeds, 1 hot Green chili (cayenne, Thai or Serrano – add 2 if you want the chutney to be very hot) sliced very thinly, seeds included and fry until the mustard seeds begin to pop and turn gray. Stir in: a total of 2 1/2 pounds of Plums, Apricots and Peaches (Or just plums or any combo you want I use about 2 pounds of plums and add 1/4 pound of apricot and peaches ), 1 1/2 Cups of Sugar, 1/4 Teaspoon Salt and simmer until thick about anywhere from 20-30 minutes. Take off the heat and fold in: a generous 2 Tablespoons of chopped crystallized Ginger, 1/4 cup of lightly toasted and roughly chopped Pecans and 1/4 cup of lightly toasted ribbon coconut. Makes a wonderful accompaniment to all Indian food, a lovely side for a cheese course and a great way to mix up your next grilled cheese sandwich. 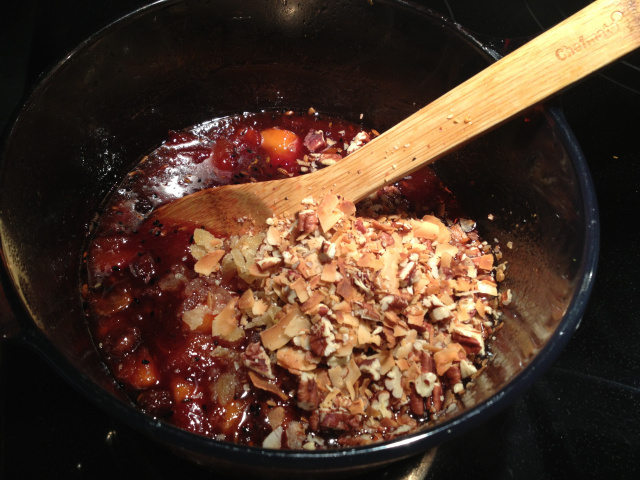 This entry was posted in Recipes and tagged apricot, crystallized ginger, Peaches, Plums, Stone Fruit Chutney. Bookmark the permalink.